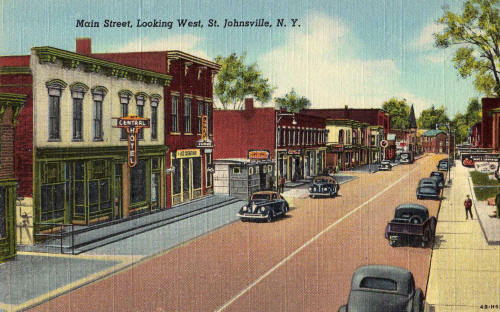 Saint Johnsville Just a Few Years Ago! $10. // Under 12 $5. ALL TAKE OUTS ARE $5. to the information contained anywhere in this site. To initiate and provide the Mohawk Valley Community, with a diverse population, history and many unique businesses an informational platform of general information. We focus our attention on information that is important and useful to visitor's, citizens and businesses of the Western Mohawk Valley Area. "St. Johnsville: the HEART of New York and the Geographical Center of the State!" Want to advertise or to continue to advertise on this and our many other websites in the Mohawk Valley Area? We have created the original and premier group of websites dedicated to the Historic and World Famous Upstate New York Mohawk Valley. We welcome repeat and new members to our family of popular websites. It costs less to advertise on this group of Websites for a WHOLE year then ONE AD for ONE issue of the local AD news publication, AND your Business will be seen by thousands of people all over the WORLD for a YEAR! Now that's inexpensive advertising! When you advertise with us there is NO MEETINGS to attend and NO POLITICS, just a great internet business exposure. The cost is only $30 a year that's 48¢ a week or less than 7¢ a day! Just print out the two PFD forms below, tell us which website you want to be on and send them with your $30 check made out to RAH and mail to: Mohawk Valley Websites, 1658 Mill Road, Saint Johnsville, NY 13452. Your ad can now be on the any or all of our websites it's your choice. And you thought you couldn't get a great deal for your advertising dollar!